In Virginia, Raja Johnson, Kimberly Carter and 206,000 more people just won back the right to vote! Sometimes, as in Virginia this past week, democracy happens, and when it does, it’s largely thanks to the work of women of color organizing. Last Friday, Governor Terry McAuliffe restored voting and civil rights to 206,000 people who had been disenfranchised permanently, thanks to Virginia’s lifelong voting ban on former prisoners. As the Governor explained, “I believe our commonwealth can not achieve its full potential until all men and women act on this fundamental right and participate in the decisions about their own children’s education, about their taxes and every aspect of their lives. Unfortunately, Virginia has had a long and sad history of effectively suppressing the voices of many thousands of men and women at the ballot box … I believe it is time to cast off Virginia’s troubled history of injustice and embrace an honest clean process of restoring the right of these men and women. 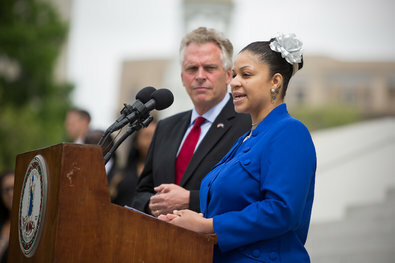 And so today, I will sign an order restoring the civil and voting rights of every single individual who has completed his or her sentence as of this day.” On that day, Raja Johnson stood with Governor McAuliffe as he spoke, and Kimberly Carter watched on television. These women, and thousands of others overwhelmingly women of color, will finally be able to vote, and so a chapter in Virginia’s decades long war on women of color may be drawing to a close. Virginia’s current code of lifelong disenfranchisement began, in 1902, as a racist attempt to keep newly enfranchised Black populations from voting. For over a century, the Commonwealth actively sustained and intensified that racism. According to Governor McAuliffe’s office, “It is estimated that 1 in 5 of the African American voting-age population is disenfranchised in Virginia because of this provision.” While the lifelong voting ban in Virginia has always been an assault on African Americans, and then on communities of color more generally, in recent years, it has also been the preferred weapon of State in a war against women of color. The so-called war on drugs targeted women of color, in particular through conspiracy laws, which have caught women for the crime of intimate relationships with someone involved in the drug trade. That’s the reason Virginia’s rate of incarceration of women has soared to 146 per 100,000. With the war on drugs, Jim Crow became Jim and Jane Crow. It’s time Virginia returned the right to vote to those who paid their debt, a debt was largely the result of racist legerdemain. It’s past time to stop the war on communities of color, and in particular on women of color. It’s time for Virginia, and all the States, to pay back their debts to the unfinished project of democracy. Raja Johnson, Kimberly Carter and hundreds of thousands in Virginia and millions across the United States are saying that the time for democracy-to-come has passed. It’s spring, and it’s time for democracy here and now. The crowd responds to Governor Terry McAuliffe’s restoration of voting and civil rights to 206,000 neighbors.